A) What was the objective of the environmental impact report ? B) What was the noise limit that the airport could generate ? C) What were the results of the sound meters ? D) How were the future scenarios simulated ? E) What conclusions were drawn from the simulation and the report ? F) What were the allegations presented ? AENA was the promoter for the Barcelona airport expansion; therefore, it was responsible for carrying out the Environmental Impact Report ('EIA') for this expansion. Among the environmental impacts that needed to be studied was the acoustic impact. 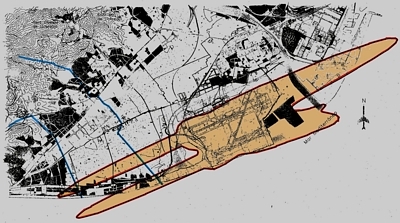 Experimentation') for the development of prior studies relating to the Barcelona airport expansion. Its objective was to undertake a series of works aimed at the evaluation of the sound levels in the Barcelona airport surroundings with the intention of its planned expansion. CEDEX put the company IBERINSA (Ibérica de Estudios e Ingeniería, S.A.) in charge of completing a technical report on the study of sound levels produced by the Barcelona airport. 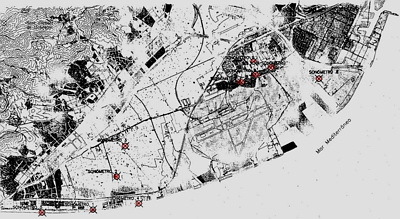 This forms part of the prior studies taken on the Barcelona airport expansion. 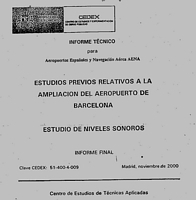 Consequently, they wanted to base the study on the existing situation in the airport at that moment(the existence of only two crossed runways and some determined air configurations) to create a simulation model that could serve as a foundation for establishing a diagnostic and to be able to detect the zones mostly affected by the acoustic impact originated by the airport's expansion and to what extent the affects would be produced in each one of the different scenarios. In that moment, there did not exist in the Spanish State any law that limited the sound levels in the vicinity of transportation infrastructures. The only precedent was the 'Environmental Impact Report' ('EIA') taken on the Barajas (Madrid) airport expansion and the later 'Environmental Impact Declaration' ('DIA'). The LAeq began to be used as an indicator of noise disturbances generated in the airport surroundings because its use was becoming widespread in all developed countries and it was the indicator chosen in advance by the European Union in the proposals of guidelines related with the evaluation of environmental noise. Without having to add them to a single index (LDN). Thus, the study was aimed at determining the value of the continuous day noise level LAeq (7-23h) and the continuous night noise level LAeq (23-7h) of a representative average day in each one of the six fixed cases. Given that the area to be studied was very extensive, the results were obtained in the form of graphic isophonic curves at land level covering the entire area studied. From sound meter 1 (located in Gavà Mar, more or less at the height of the "Les Marines" Restaurant), with the passing of planes the noise levels surfaced with clarity over the background noise levels and the total noise level was very similar to the noise level caused by the airplanes. In other words, the noise from the planes was the main source of noise when takeoffs were performed from the main runway. In the city center of El Prat de Llobregat, sound levels from local sources (traffic, industry, noise from neighbors) completely masked the noise levels caused by the passing of airplanes. In Gavà Mar, the equivalent day levels were less than 65 dBA and night levels were less than 55 dBA, but they recognized that the situation during the night period was worse than during the day period. 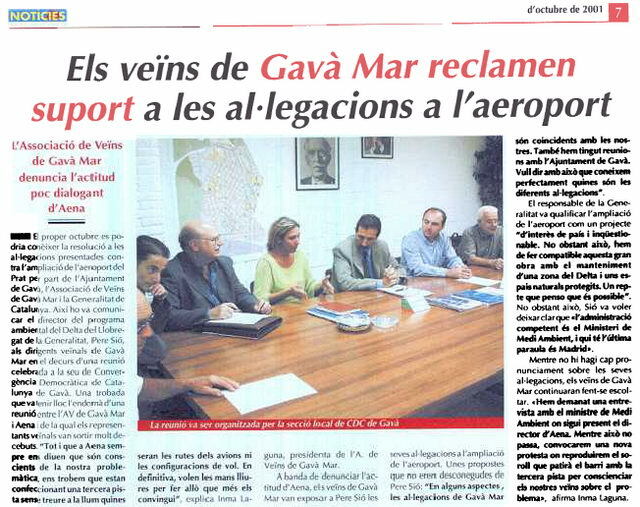 The 'EIA' emphasized that the sound meters situated in Gavà Mar gave average values below 65 dBA. Also they could have stressed that they obtained daily average readings from the LAeq of more than 60 dBA because of takeoffs from the main runway that have been performed since 1997, and mostly because of the takeoffs of obsolete airplanes (defined as chapter II) that flew over us at that time. Also, it should have been highlighted that these daily averages greater than 60 dBA never had been produced before the main runway's use for takeoffs in the direction of Gavà Mar. They were perfectly avoidable using the transverse runway to perform all takeoffs towards the sea. 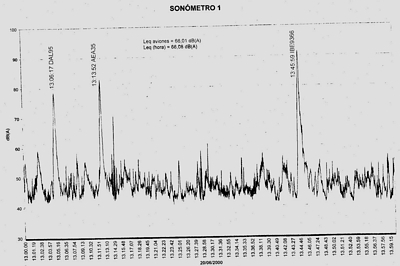 IBERINSA used the technique of acoustic case simulation by means of a computerized mathematical model for the foresight of sound levels called INM (Integrated Noise Model) in its 6.0 version (developed in the USA). According to them, the simulation was, in practice, the only available method to estimate the sound levels in temporary situations different than the present. The information limited to takeoff and landing operations for the considered period of calculation including the description of the aircraft model that performs every operation and the flight routes that they follow during their takeoff and airport approach operations. Furthermore, during takeoff operations, the INM model allowed for the differentiation of certain "distance categories" according to the origin distance - flight destination. It established a specific load for combustible and conditioned the aircrafts' profiles during the takeoff and distancing phases. Therefore, influencing the level of sound perceived from the ground. The contours of equal noise level (or isophonic curves) made up the fundamental graphic result of the calculation process. For its elaboration, once the Leq values were obtained for the points that made up the calculation net, an interpolation process was applied that made it possible to draw the contours for the Leq values that were chosen. Following the established precedent of the Barajas expansion 'EIA' that was later accepted by environmental authorities, they considered acceptable for the noise calculation a representative day in which the total traffic represented between 80 and 90% of the day traffic peak. In addition, a small analysis was also done on the influence of the straying of the actual plane trajectories away from the official nominal routes on the isophonic curves of El Prat airport. They ended up concluding that the influence of the dispersions was low, but they insisted that there must be alertness and adequate control over the trajectories the planes follow. E) WHAT CONCLUSIONS WERE DRAWN FROM THE SIMULATOR AND THE REPORT ? 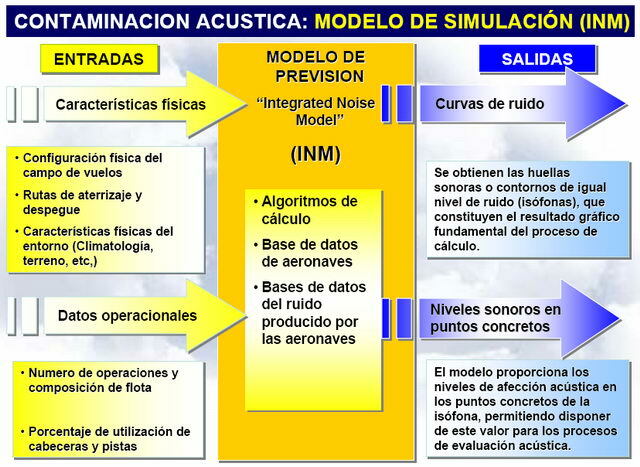 After analyzing the average results obtained from the sound meters for all the configurations and after comparing them with the results obtained with the INM model, they concluded that the results obtained by the INM model were valid for scenario 1, thus, it allowed for the simulation of the five future scenarios. To simulate all these scenarios, they proposed to use the EAST configuration as preferential stating that, according to data collected by AENA (and provided by the National Institute of Meteorology), the percentage of hours per year in which it would be absolutely necessary to operate in a WEST configuration would not surpass 15%. In order to estimate the noise levels that would be produced in atypical situations -but that could be significant in the affected zones-, they considered the possibility of a 50% distribution of WEST and EAST configurations, besides the 15% for WEST configuration. Due to the anticipated disappearance of the noisiest aircrafts (classified as chapter II) the affected areas in Gavà Mar will tend to decrease, even though the nighttime will continue to be more critical than the daytime. It will entail a modification of the takeoff and landing routes, which will notably influence the affected zone. In Gavà Mar, the affected zone will move to the north and its extension will decrease with respect to the current situation. 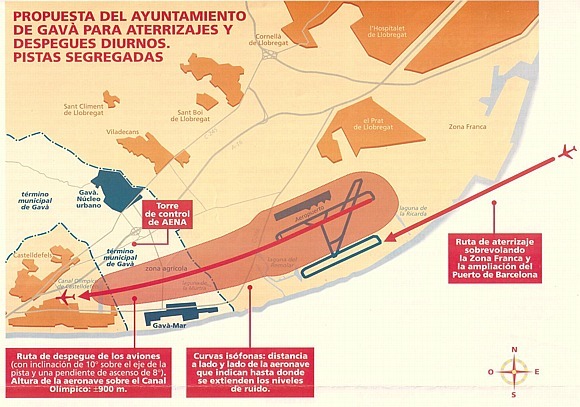 In El Prat de Llobregat, the affected zone will be almost limited to the head of the transverse runway. - Scenario 6 - Anticipated saturation of the airport for the year 2025. A similar situation to the previous one because the increase in operations of an already elevated level of air traffic will hardly modify the affected zones, since all the aircrafts will belong to chapter III and the routes and configurations will continue to be the same ones as in the previous scenario. As a consequence of the increase in traffic and the type of aircrafts, and the variation in the takeoff and landing routes, the LAeq equivalent sound levels perceived in the towns closest to the El Prat airport will be modified. 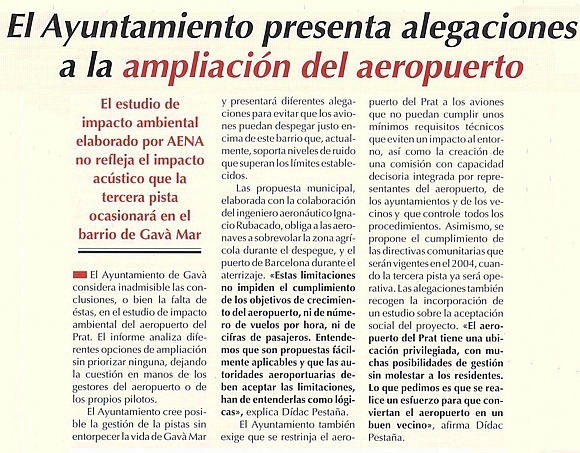 The environmental impact of the El Prat airport expansion on Gavà Mar will be "MODERATE-SEVERE"
The decline in the quality of life in Gavà Mar was measured as slight. Time has shown that the impact has clearly been SEVERE and the decline in the quality of life has been very SERIOUS and not slight. The rapid growth of air traffic in the Barcelona airport has moved forward the schedule of the scenarios in such a way that the saturation scenario will actually occur in 2015 instead of 2025 (10 years before!). Therefore, AENA plans to move forward the start of the independent operation from 2015 to 2008 coinciding with the setting in motion of the new south terminal area. 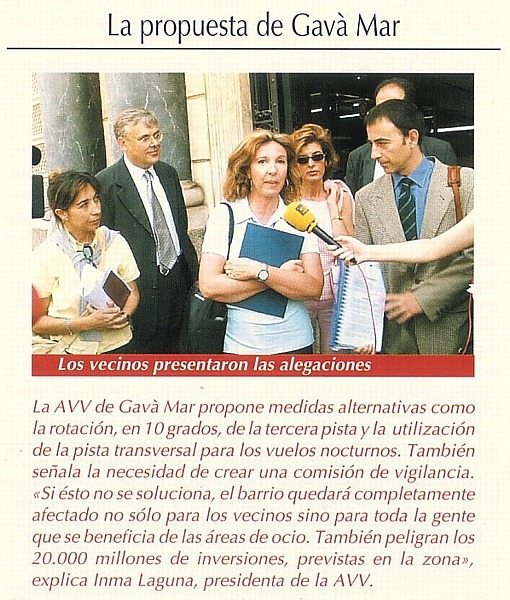 This independent operation, if it becomes a reality, will mean DEATH for all Gavà Mar and a large part of Castelldefels beach. Solicits the nullity of the presented 'Environmental Impact Report' given that alternative studies do not exist. Requests the prohibition of flying over Gavà Mar at night and during the day except in exceptional cases. Requests that the WEST configuration be set up as preferential. Requests the establishment of a sound control and vigilance system in which the affected organizations would participate. Requests that they develop new sound prints using the measurement values that were taken by an organization independent from AENA during Holy Week. States that the only feasible alternative is the one presented by this same organization, consisting in rotating the current runways 10 degrees, constructing a new runway and situating the new terminal area on the east side.